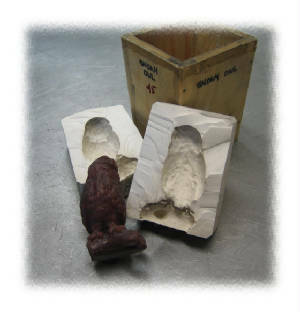 The casting process begins with the creation of an original sculpture The SNOWY OWL shown here is created in French Modeling Wax. Other materials used may be clay, epoxy, wood or plastic. Molding is next and using liquid rubber. 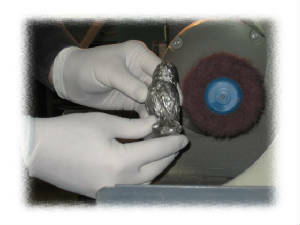 A mold container is constructed around the sculpture allowing a mass to serve as a heat sink for direct metal casting. This delicate step may take as little as one day or as many as four weeks depending on the complexity and size of the original sculpture. After the mold rubber has cured, the frame is removed, and the mold is cut apart reveiling the original model. 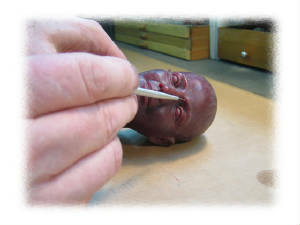 The wax or clay model is removed and the cavity left is prepared for molten metal, poured directly into the original mold. Fine Pewter is an alloy of Tin with antimony and copper and has a melting point of 425 degrees F.
Bronze is an alloy of Copper with tin and has a melting point of 950 degrees F.
No lead is used in the Cordsen Design Studios products. 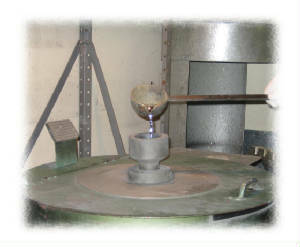 The temperature at pouring is somewhat higher than the melting point allowing the metal to flow into all details of the mold. The mold may be spin cast if the mass is not too great. 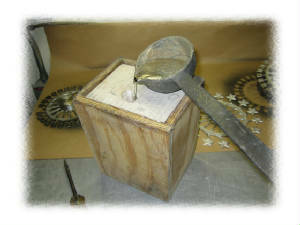 This forces the molten metal into fine detail and is used for small figurines, animals and ornaments with thin sections. 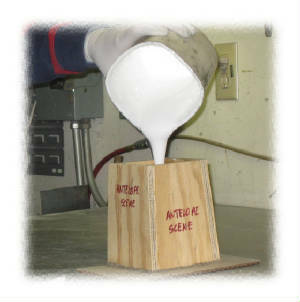 Gravity or vacuum casting is used on larger sculptures when there is a heavy mass. Care must be taken to allow the metal smooth flow into the cavity without overheating, causing a faulty cast or distortion. 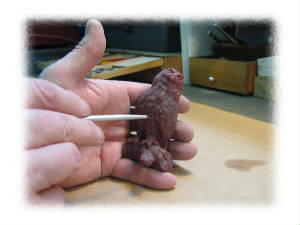 After a cooling, the casting is removed from the mold, sprues and vents trimmed and correction of any flaws from casting begins. The patina is the final process. Depending on the desired look, this is achieved by use of acids, enamels, urethanes or metal dyes. 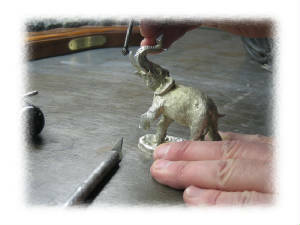 The finished sculpture is sealed with clear lacquer and waxed to retain its lustre. Cordsen Design Studio is a proud subscriber of the "WATTS IN THE WIND" program utilizing clean, renewable wind energy. Our melting furnaces, finishing drills, sandblasters and equipment are powered by the fastest growing energy source in the world, wind power. 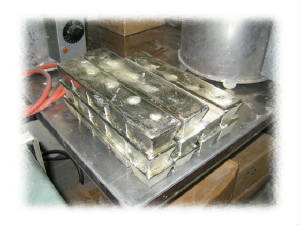 Our metals are supplied by US companies using clean energy, virgin lead free metals and no recycled scrap. Our patina processes are water based finishing techniques with no downstream pollution.